Lily Candle. Just to brighten your day. Lily moulded candle is a must have for summer garden parties, August and September weddings, romantic dinners, and just to brighten your day. It also makes a gorgeous gift to your wedding guests. This would be a great way to leave them with something that can remind of this special day. The candle measures 4.5 cm (1.77”) in height 8 cm (3.14”) in width, has a cotton wick, and is the perfect nontoxic eco-friendly addition to your home decor. Spring has arrived! 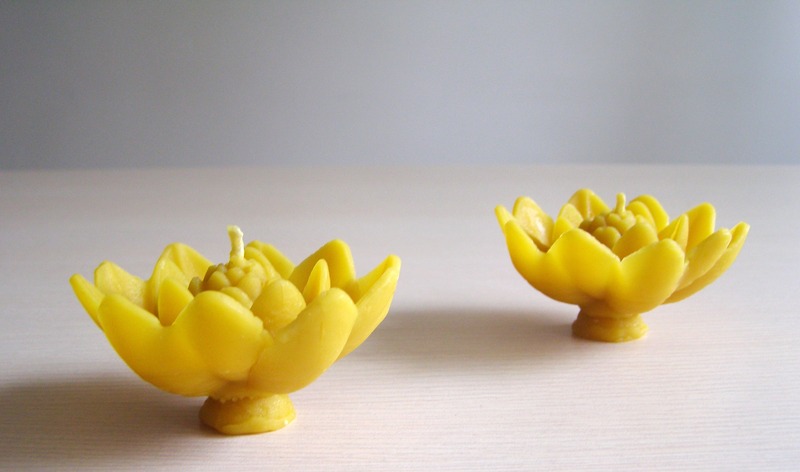 Celebrate it by burning those fabulous Lily shaped pure beeswax candles. They can be used as centerpieces of your flower arrangements or just around the house. Lily candle is a must have for garden parties, August weddings, romantic dinners, and just to brighten your day. 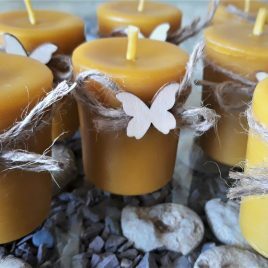 100% pure bees wax candles are sure to look spectacular and add a touch of sunshine to any table any time of the year while the warmth of the candle flame will warm up your heart even during the cold winter nights. If you are getting ready for one of the brightest days in your life – your weddings, you could also impress everyone by giving this gorgeous souvenir candle as a wedding present for guests. This will be a great way to leave them with something that will remind them of this special day. You think there is no difference between the cheap candles from the supermarket and a beeswax candle? Think again! 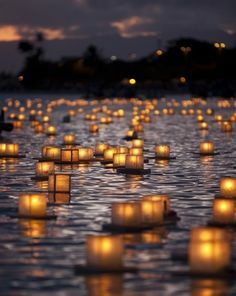 First of all, with a beeswax candle, you are not poisoning yourself with the toxins cheaper candles can release into the air. Beeswax candles burn cleanly. 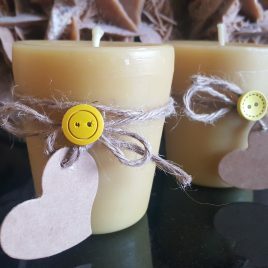 In fact, beeswax candles help cleanse the air from mold spores (which is a big problem in many Irish houses), odours and other floating nasties. Secondly, pure bees wax candles with their delightful sweet fragrance burn more efficiently resulting in longer burn times (and thus providing better value for money). And finally, Bees wax candles produce a natural glow that is closest to sunlight and give off more light than other wax candles. Candle Safety Info: Trim wick to ¼” before each use. Never leave a burning candle unattended and always burn on a stable heat resistant surface. For longer burn times, keep away from drafts. Avoid touching or moving the candle while it is burning or if the wax is still hot. Keep out of reach of children. Trim wick to ¼” before each use. Never leave a burning candle unattended and always burn on a stable heat resistant surface. For longer burn times, keep away from drafts. Avoid touching or moving the candle while it is burning or if the wax is still hot. Keep out of reach of children. Our hypo-allergenic Coral Pillar Candle is the perfect gift. They measures at 8X10cm and comes in the beautiful golden color of beeswax. You’ll love the sweet fresh honey aroma and that glowing ball around the flame. 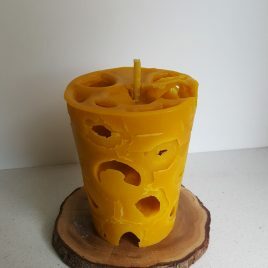 The way this candle burns is very unique. The flame goes down slowly creating a space inside the candle and the light filters through softly glowing like a shining lantern. Note: before use it is necessary to remove decoration. ALWAYS remove decorations before burning! 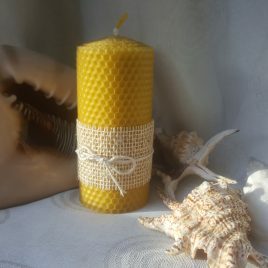 IMPORTANT HoneyComb Pillar Candle burns up to: - 20 hours if you follow the Burning Instruction and burn it intermittently. - 10 hours if you follow the Burning Instruction and burn it continuously. 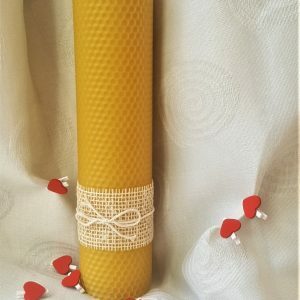 This carefully and individually hand-rolled honeycomb pillar candle is the No1 choice for everyday candle burning due to its long burning time (up to 20 hours) and its beautiful, neat and traditional look. It comes in three different sizes (8.5, 13 or 26 cm height) to fit any area at your home. 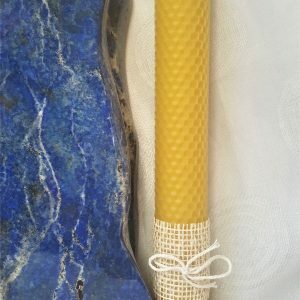 While the performance and beauty of beeswax candles speak for themselves, they are also environmentally-friendly, biodegradable and sustainable products. 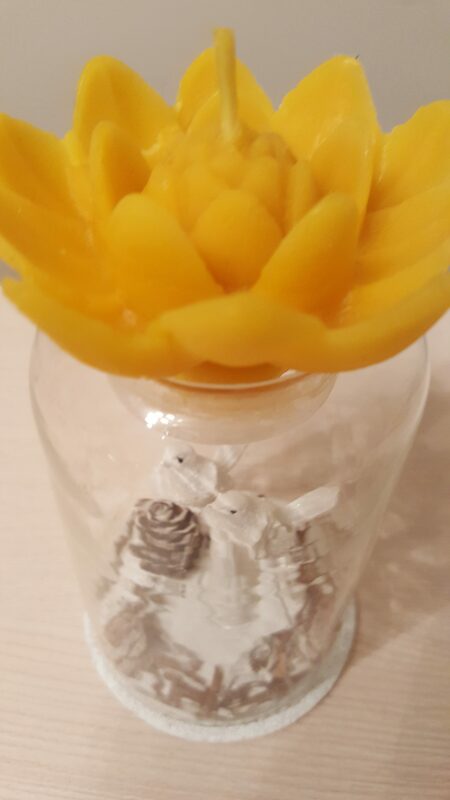 Producing a beautiful luminous glow, they fill the air with the natural sweet scent of warm honey, are long lasting and carbon/toxin free. ALWAYS remove decorations before burning! IMPORTANT Large Votive Candle burns up to: - 28 hours if you follow the Burning Instruction and burn it intermittently. - 20 hours if you follow the Burning Instruction and burn it continuously. Note: before use it is necessary to remove decoration. 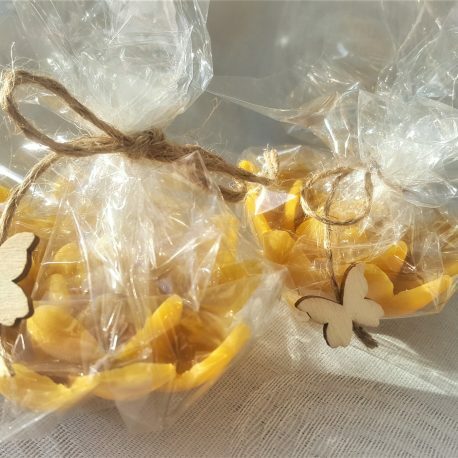 Our large size votive candles are hand made with pure lightly filtered 100% beeswax and lead free cotton wicks. They burn soot and smoke free up to 28 hours (providing you use the right votive holders that fit their shape). 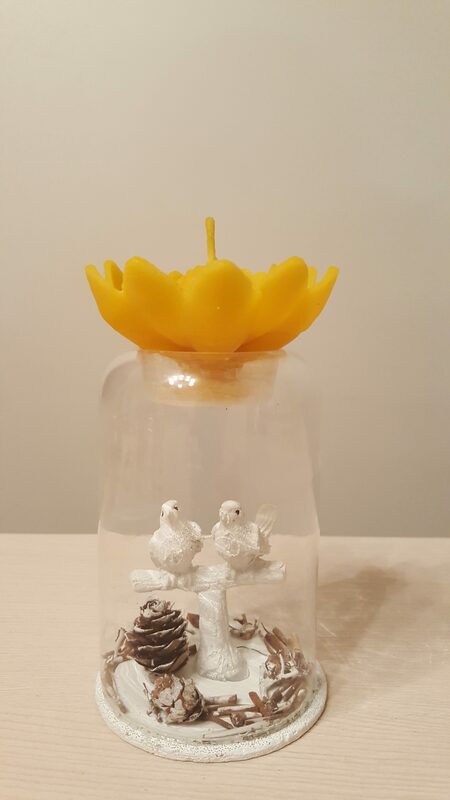 Measuring at 8cm (height) x 7cm (widest width) x 5cm (smallest width) they emit a natural, light honey aroma when burning and burn until the wax is completely gone. 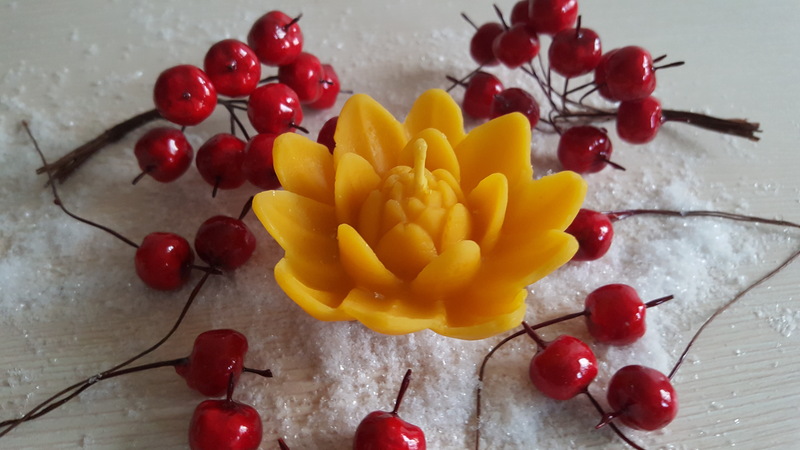 You will probably notice and love the glowing ball around the flame of the beeswax candle. Use their natural beauty to complement your home interior decorating style to make it warm and inviting. 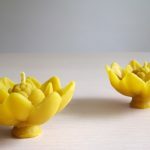 The colour of the beeswax candle: why does it vary? ALWAYS remove decorations before burning! 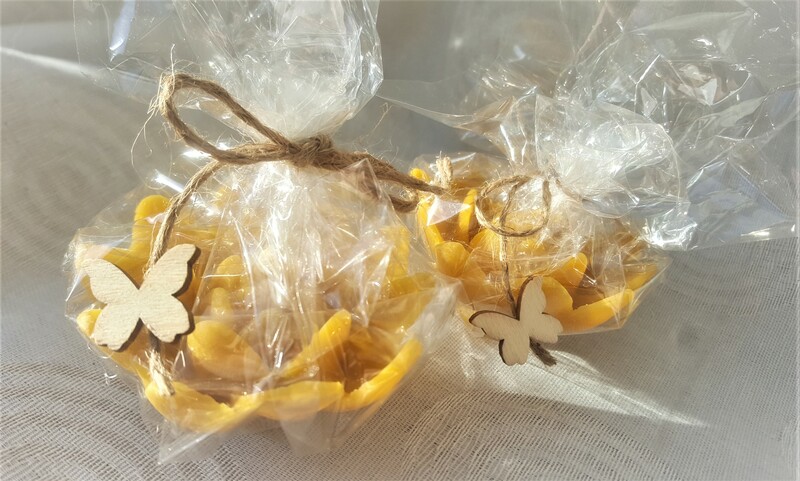 Our hypo-allergenic votive candles are hand made with pure lightly filtered 100% beeswax and lead free cotton wicks. They burn soot and smoke free up to 9 hours (providing you use the right votive holders that fit their shape). Measuring at 5 cm x 4 cm they emit a natural, light honey aroma when burning and burn until the wax is completely gone. You’ll probably notice and love the glowing ball around the flame of the beeswax candle. Use their natural beauty to complement your home interior decorating style to make it warm and inviting. 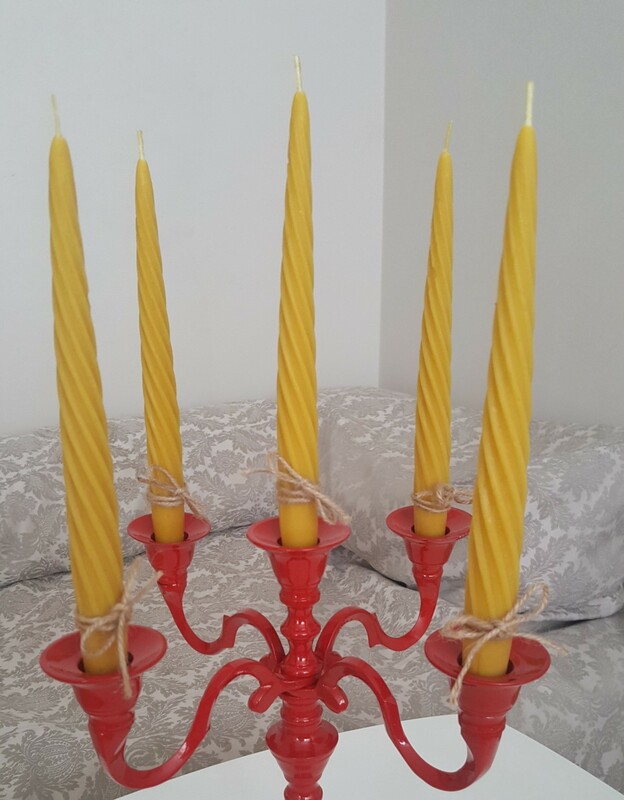 The colour of the beeswax candle: why does it vary?